Users of the cycle to work scheme are saving 112,210 tonnes of CO2 every year, according to new research published today by the Cycle to Work Alliance. The survey also found that the scheme continues to play an important role in encouraging more and more commuters to travel to work by bicycle, attracting new cyclists onto their bikes. The Cycle to Work Alliance’s The Green Way to Work report, which surveyed over 18,500 employees who use the cycle to work scheme, examined why the scheme motivates so many people to commute to work by bike, and how this helps both central and local government meet their sustainable transport objectives. Users of the cycle to work scheme are cycling over 13 million miles per week and, of these commuters, 67% would travel to work by car if they did not cycle to work. Through their participation in the scheme, these commuters are saving 112,210 tonnes of CO2 in reduced car emissions. The research also highlights the importance of the scheme in encouraging people to cycle to work. 54% of participants told the Alliance they did not cycle to work before signing up to the scheme, while 72% said they would not have bought their bike if it had not been available through the scheme. More broadly, the scheme is helping to increase interest in cycling with 40% of individuals who classed themselves as novice or occasional cyclists when they joined the scheme, now feeling themselves to be enthusiast cyclists. However, it’s not just employees who benefit from the scheme. 98% of respondents said they would encourage other colleagues to take part in the scheme, demonstrating its importance as an engagement tool for employers. The Government has set ambitious targets for cutting carbon emissions and creating a more sustainable transport system. These objectives come at a time when public spending is being cut back, meaning solutions have to be cost effective and efficient. This new research by the Cycle to Work Alliance shows how the scheme is helping the Government achieve its goals, while providing commuters with an affordable and sustainable form of travel. “I am delighted to see that the Cycle to Work Scheme continues to grow, and it is encouraging that findings in this report show that more and more commuters are looking towards cycling as their main mode of transport to work. 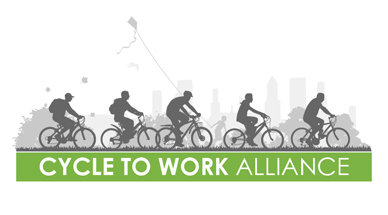 “This new research by the Alliance is important in demonstrating the benefit of the cycle to work scheme in achieving the Government’s sustainable transport objectives. It highlights how the scheme encourages commuters to give up expensive and environmentally unfriendly cars, and instead look to cycling as a sustainable alternative.